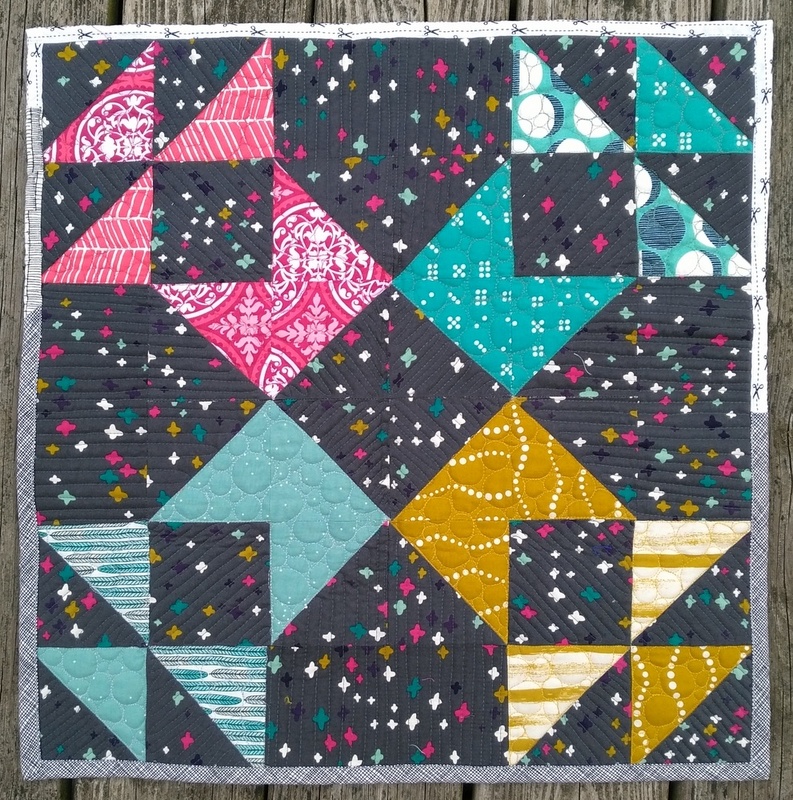 I'm excited to share a small, happy mini quilt with you today! I knew that I'd be staying at my friend Liz's (@beadqueene) house when I traveled to Maryland for my workshop last weekend, and I wanted to make her a thank you present for hosting me. 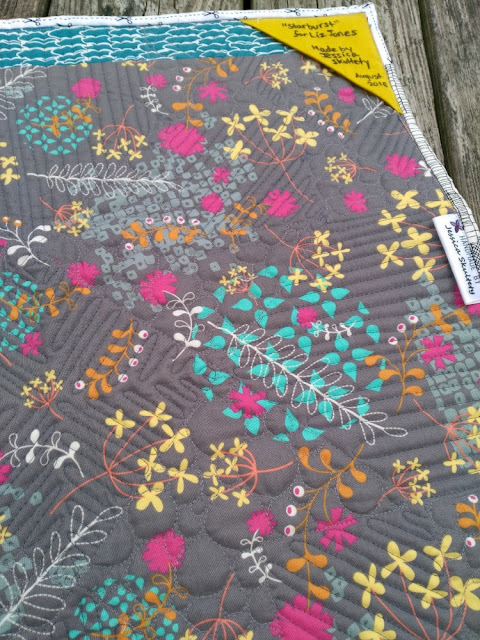 She loves mini quilts and bright colors, so I started with the below beautiful plus fabric ("It's A Plus" from Koi by Rashida Coleman-Hale, which I've luckily hoarded, as it's long out of print). 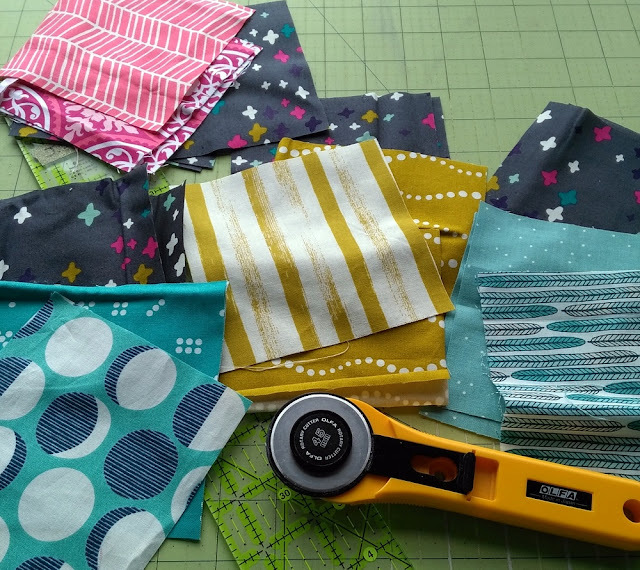 I pulled colors from my fabric stash that matched (or closely complemented) the pluses. 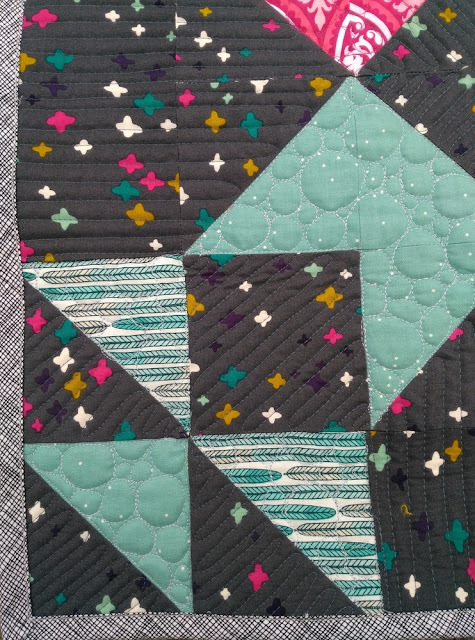 I decided to separate the colors in a star design, and inevitably returned to the amazingness that is the Ribbon Star quilt block tutorial by Faith of Fresh Lemons Quilts. 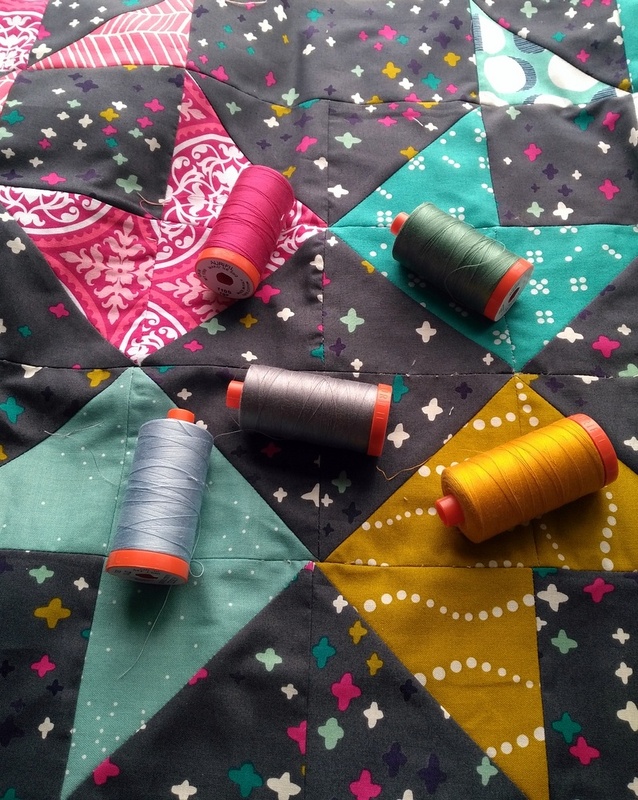 I added the extra HSTs coming off of it to a) showcase more fabrics and b) to mimic my Epic Anna Maria Horner medallion (that's probably my favorite part of that quilt!). I was a little hesitant to use the pluses as the background, but it quickly became clear that the small print would not overwhelm the quilt. In fact, in this case, I'm much happier that I used it instead of a solid! I used the following Aurifil colors to blend with or slightly pop against the fabric: 1100 (magenta), 2135 (yellow), 2850 (green), 2710 (light blue), and 5004 (dark gray). Liz saw the sneak peek of the back on Instagram (pictured below) and wanted to know which fabric it was! You guessed it: another Rashida print from her even older Washi fabric line. It just fit! 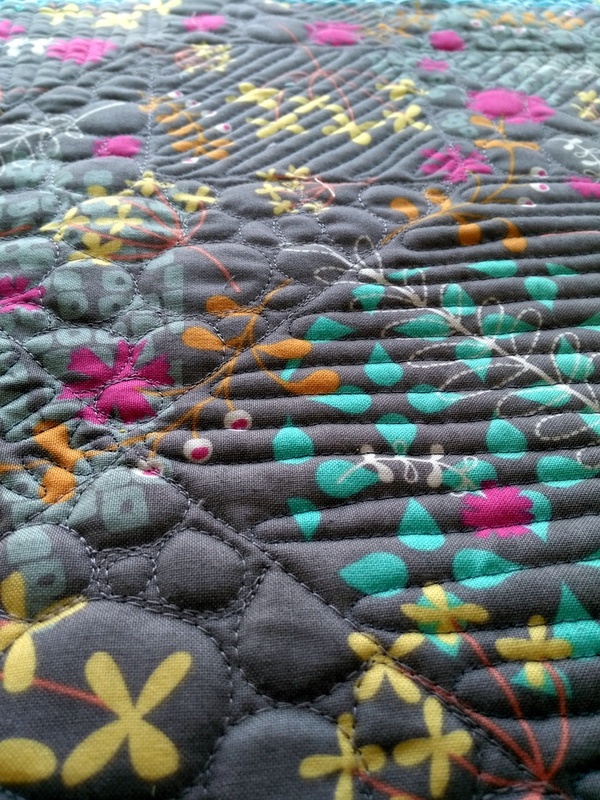 Upon finishing, I reflected about how awesome it is to make mini quilts. You can try out a big idea on a small scale. You can quilt them really densely without worrying about much wear and tear or washing. You can make something special for someone that takes much less time (and money) than a large quilt. It can be apart of their decor or table or sewing room for years to come! Thumbs up, mini quilts. I hope this little quilt can find a happy place near X Marks the Spot! Thanks again, Liz, for a super fun weekend! Linking up to Needle and Thread Thursday, Fabric Tuesday, TGIFF. I love this!!! Gray is a lovely background fabric, but the pops of color with this are so great!!! All of the fabrics work so well together including the backing! What a great gift! Beautifully done! The crosses in the background are perfect. Great design! I really like the choice of the background fabric, it really adds interest to the quilt and goes so well with all of the other colors. I love that print as a background!